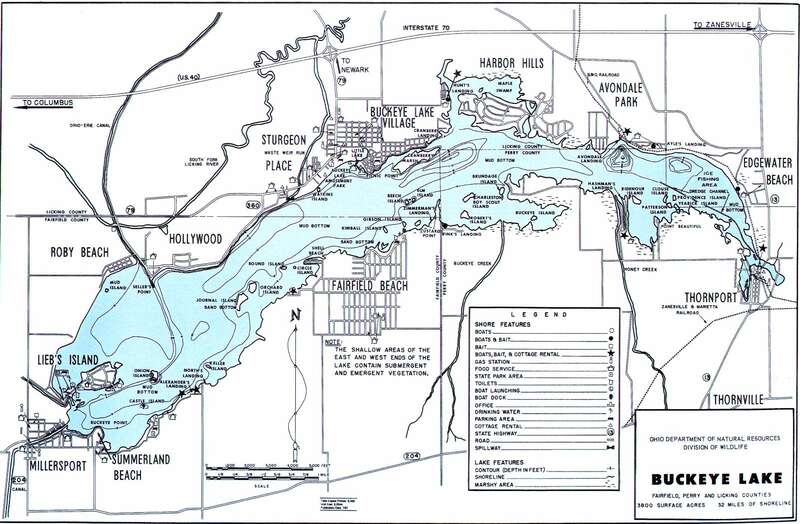 Here’s an ODNR Division of Wildlife Buckeye Lake fishing map with shore features, Buckeye Lake weather, plus information about fishing opportunities and boating regulations at 3800-acre Buckeye Lake, OH. Buckeye Lake is in south central Ohio in Fairfield- Perry- Licking counties. This area is within Ohio Division of Wildlife District 1. 3,600 acres of fishing water with 32 miles of shoreline. In south central Ohio about 25 miles east of Columbus. The lake is accessible from I-70 east on any of the following roads; State Route 13 – SR 37 – SR 79. Approximately 120 miles south of Cleveland — Approximately 25 miles east of Columbus — Approximately 130 miles southeast of Toledo — Approximately 120 miles northeast of Cincinnati. Largemouth Bass * Muskellunge * Bluegills * Crappie * Channel Catfish * Brown Bullheads * Yellow Perch. There is a boat rental. Horsepower is unlimited. Be very careful with your boat as the lake averages only 4.5 feet deep. There are four improved public boat launches. There is an Ohio Division of Wildlife fish hatchery nearby so the lake often receives a surplus fish stocking.